Here is an example of declaring a RadWindow. To open the RadWindow you have to call its Show() method. Here is an example. In order to make the window modal you have to call the ShowDialog() method. To learn more about modal windows read here. To add content to the RadWindow you have to use the Content property or the ContentTemplate property. Here is an example of setting the Content property. As the Content property is of type object you can set it to any control that you like. If you want to have a more complex content that consists of more than one control, be sure to wrap them inside a layout control and pass the layout control as content.You can also set the content of the RadWindow to a UserControl. You can skip the in-line setting of the Content property and define the content directly under the RadWindow tag. There is a set of predefined dialog windows that can be directly used. 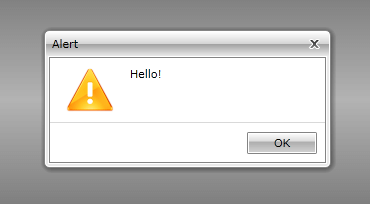 Such windows are the Confirm, Alert and Prompt dialogs. These dialogs can be shown by calling the respective methods of the static RadWindow class. 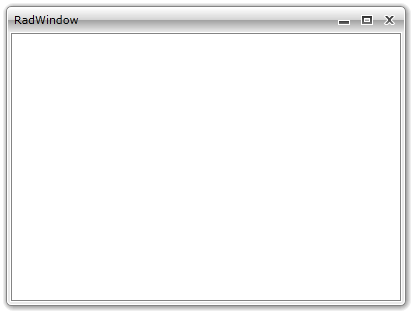 All of the predefined windows are modal windows. Alert() - shows an alert dialog. This method has 3 overloads. To learn more read here. 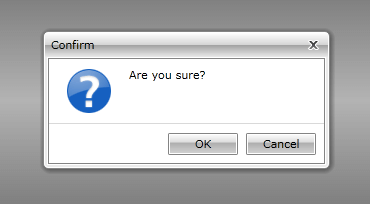 Confirm() - shows a confirm dialog. This method has 2 overloads. To learn more read here. Content = "Are you sure?" parameters.Content = "Are you sure?" Prompt() - shows a prompt dialog. This method has 3 overloads. To learn more read here. 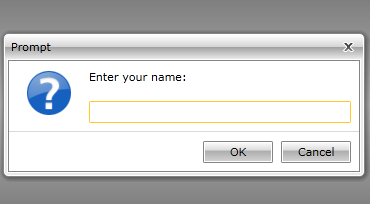 Content = "Enter your name:"
parameters.Content = "Enter your name:"